Place the lemongrass on a chopping board. With the back of a large knife, hit the thick section of the lemongrass until bruised and slightly broken. Place the lemongrass into a large, deep frypan. Squeeze the lime juice into the pan, and place the remaining whole skin into the pan also. Add the coconut milk and fish sauce, and place the pan over medium heat. Once beginning to boil, add the redfish fillets and turn the heat to low. Simmer for 8 minutes, or until just cooked through. Remove the redfish from the pan and set aside. Strain the poaching liquid, reserving 1 cup, and discarding the solids. Place the cucumber, salad leaves and coriander into a large serving bowl. Add the poaching liquid and toss to combine. 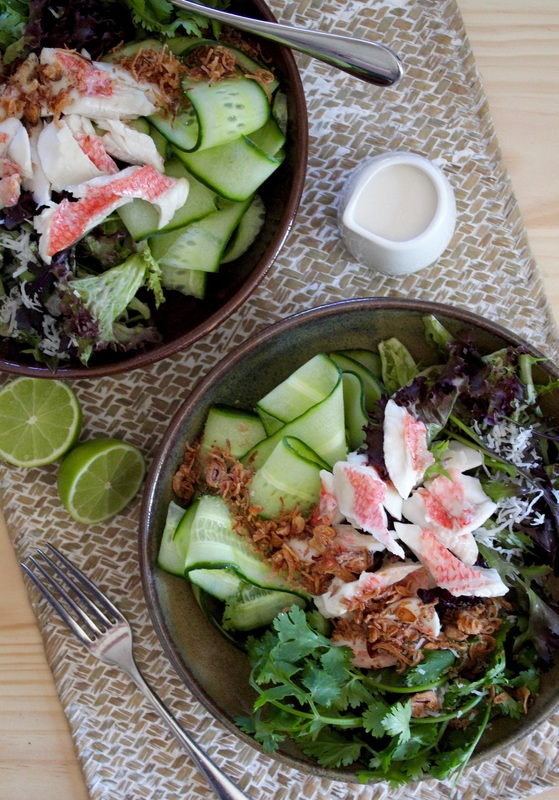 Flake the Redfish into large chunks over the salad, and top with coconut and fried shallots to serve.